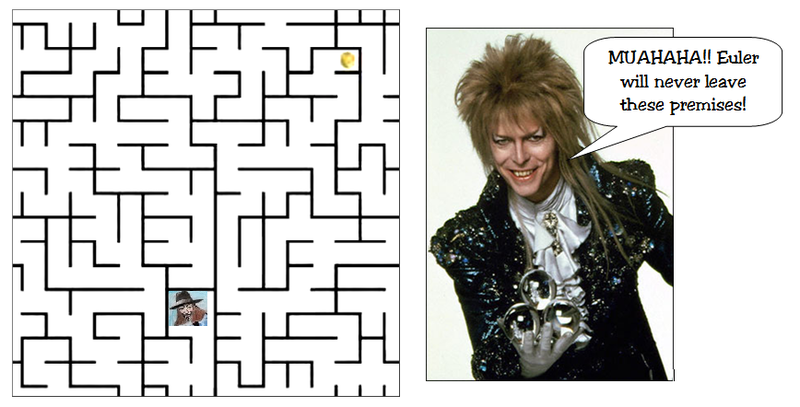 Our beloved hero has been mysteriously teleported into a bizarre labyrinth. It seems the responsible for this is Jareth the Goblin King, who was bored stiff and decided to put Euler into this trial. Help Euler to get to the teleport pod to leave this nerve-wracking maze! - Print the labyrinth’s map and fold it as if it were a cylinder. - This way you will have the chance of continuing your path. - Draw the path which leads into the pod on the paper. - Hand in your solution with your name written on the back side.